Quilting is an obvious choice for a lover of fabric, allowing for endless combinations of patterns, prints and colors. to create a larger composition which becomes much more than a sum of its parts. 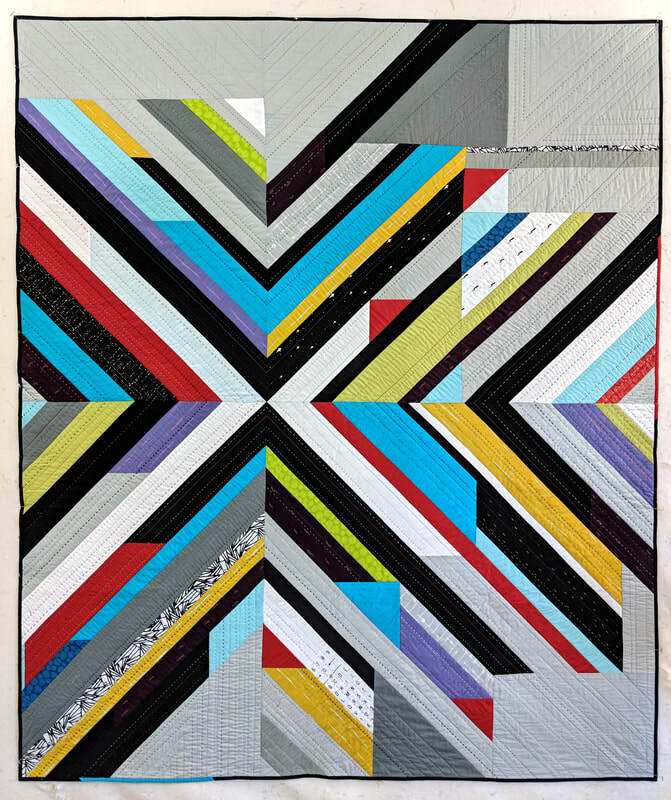 My quilt Flux was not only chosen to be exhibited, it also won a 2nd Place ribbon in the Handwork category! This is the first time I have won any awards at a quilt show, and I am very happy for the acknowledgment of my work. 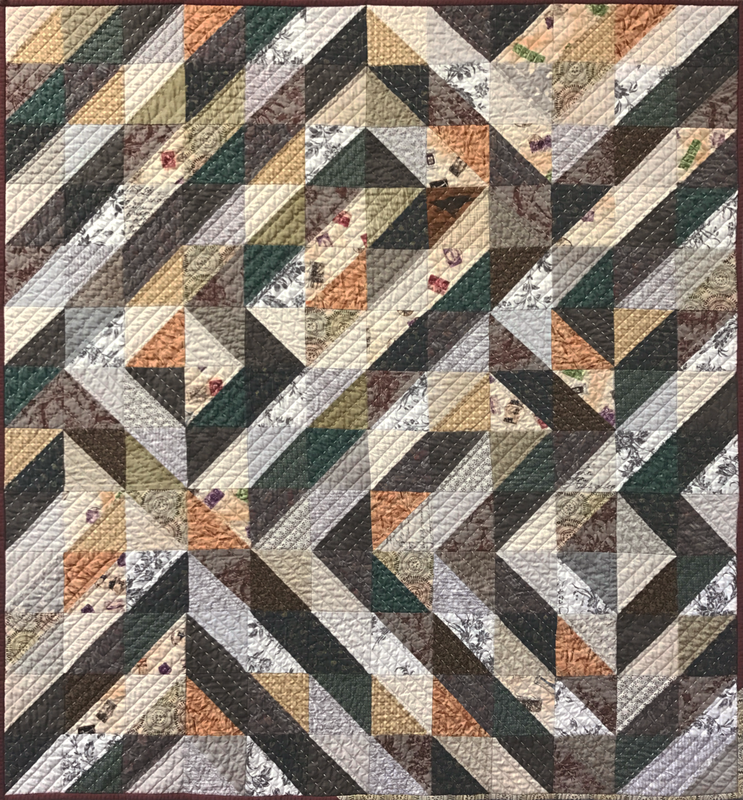 I did not attend QuiltCon 2019, but having attended in the past, I know that there is some phenomenal handwork being done by my contemporary quilters. I am honored to be counted among some truly great craftswomen. Thank you to all who went and sent me pictures, and to those whose kind words about my work continue to encourage me. ​I see inspiration everywhere, and I am always collecting images that make me think of quilts: modern art, architecture, geometric designs, and maps. My Flux quilt was inspired by an abstract painting by Jeff Depner. It's important to me that my quilts are my own artwork demonstrating my creativity instead of directly copying the original inspiration. I changed the colors, the composition, and the specific shapes, while keeping the general look and feel of Depner's original painting. 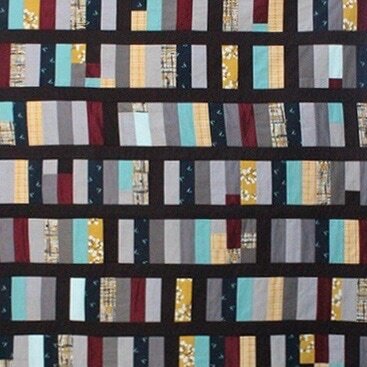 ​Curated Quilts is a magazine showcasing the art of modern quilting. Printed on luxurious heavy paper, and brimming with gorgeous photos, inspiring quilts, and the words of distinguished contributors from today's quilting world, this ad-free magazine is a rare treat and a treasure. 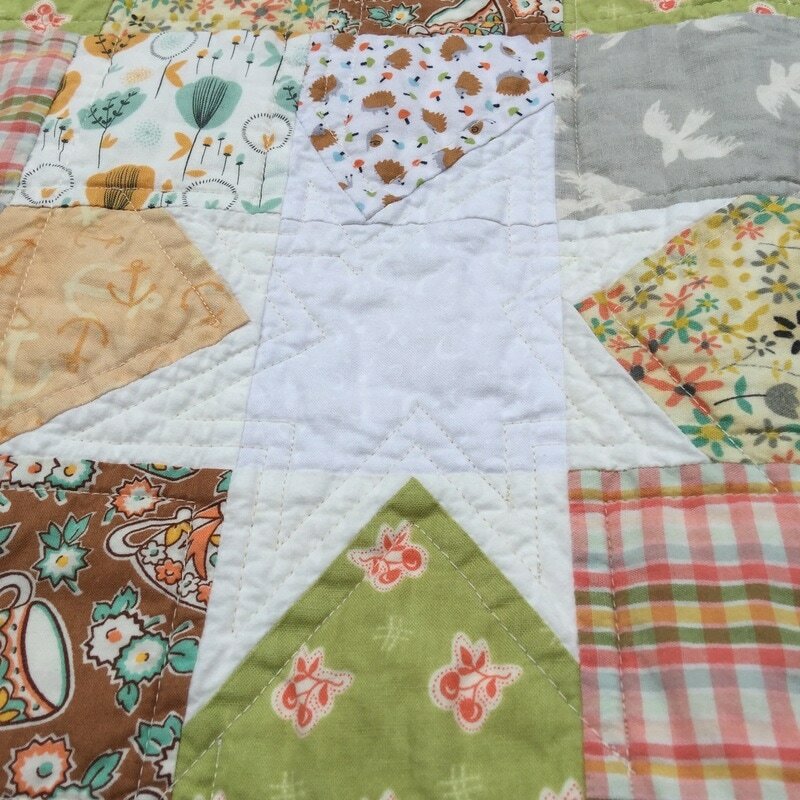 ​One of the regular features is a Mini Quilt Challenge, calling for quilters to create a new mini quilt (10"x10" to 16"x16") according to a chosen color palette and theme. For Issue #1, my submission Mirrored Windows was chosen to be included! It's an honor to have my work shown alongside such talented quilters. Find my mini quilt on page 76 of issue #1. Again, my mini was chosen to be published! ​Challenges such as these hosted by Curated Quilts provide a way for modern quilters to find recognition and exposure to a wider audience. My quilt and I travelled to Savannah, GA in February to attend QuiltConEast. QuiltCon is an annual conference hosted by the Modern Quilt Guild, to encourage and develop the art of modern quilting. MQG is a non-profit worldwide guild with more than 170 chapters, including my local chapter in Orange County. 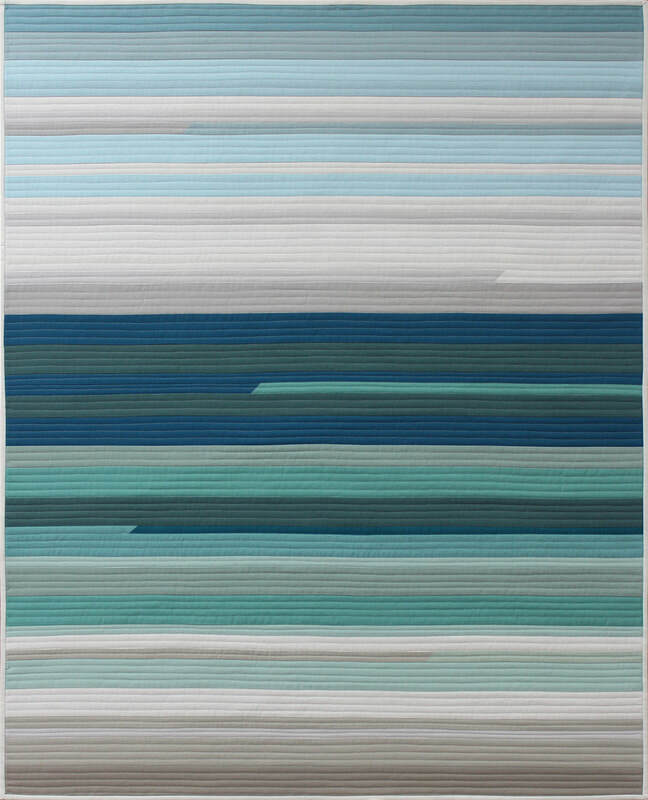 ​"Sea Horizon, West" represents the beginning of my new series of Horizon quilts. The imagery is borrowed from my Horizon paintings, with horizontal layers of soothing color that evoke the ocean and sky. ​"Sea Horizon, West" is featured in the Modern Quilt Guild's book "Modern Quilts: Designs of the New Century"! It's an incredible honor to be included among some of the most influential artists in the Modern Quilting movement. Further developing the concept for Sea Horizon, West (above) I explore representing the horizon in various color combinations, evoking different climates or times of day. I think of these as artworks. I am essentially painting with fabric: design and pattern are minimized, and the entire exercise is about how the colors work together. ​These framed works are smaller, and require careful stitching to keep the narrow lines straight. Some of the fabric strips are only 5/8" wide, leaving only 1/8" showing in the finished piece. These small framed quilts are wrapped around wooden stretchers and set within a simple floater frame. This leaves the stitching visible on the back, and the edges have a little breathing room. All of my quilts are designed, machine stitched, and machine quilted by me on my domestic machine (unless otherwise noted). Each has a story. Click the photos to learn more. I also make quilts by special request: t-shirt quilts, remembrance quilts, and finishing of vintage quilt elements from your craft box or attic. Partial projects are welcome: piecing only, appliqué, adding sashing to existing blocks, or adding borders to existing quilt tops. Long arm quilting services are referred to Cosmic Quilting, in Laguna Hills, CA. I love creative commissions! Contact me about creating an original heirloom piece for someone you love. 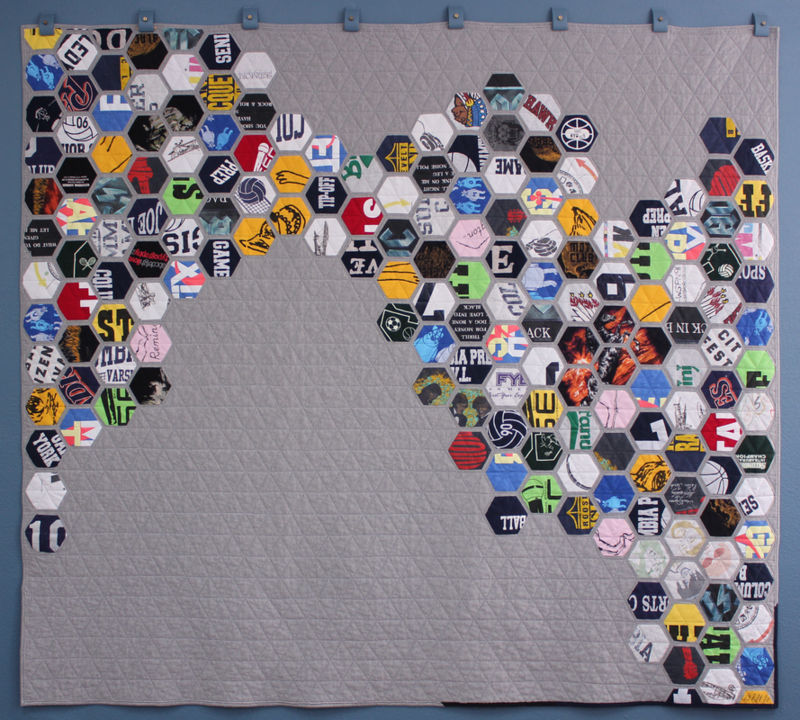 All of my quilts are cotton, machine pieced, and machine quilted by me.